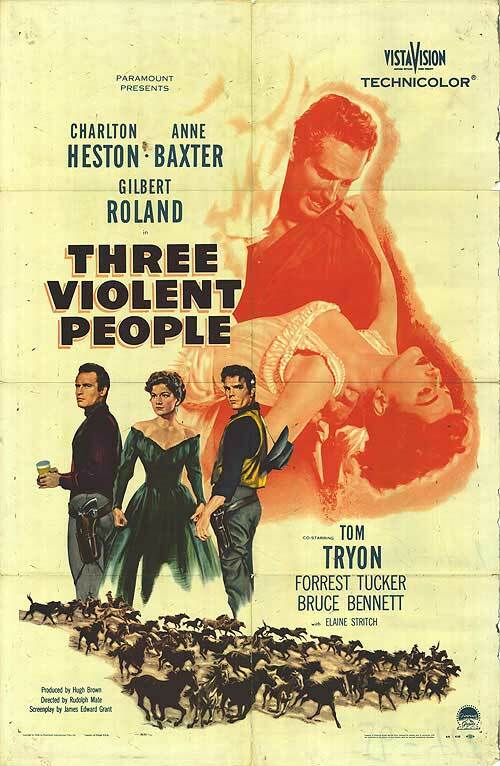 There are three leads in Three Violent People: Charlton Heston, Anne Baxter, and Tom Tryon, but despite the title, only one was really violent. Three Violent People is a B-Western, one that might have been better if not for some bad acting and a plot that was rushed and with unexplored elements. Colt Saunders (Heston) is a Confederate captain returned to his native Texas to return to a life of normalcy. He finds his home state overrun with carpetbaggers, eager to sweep in and take all the land of the rebels through high taxation. Saunders has plenty of money and has yet to be touched by the encroachments of the carpetbaggers. He has been touched by Lorna Hunter (Baxter), a former 'dance-hall girl' who uses her Southern charms to quickly, very quickly, win Saunders over. She at first tried to just rob Saunders of his recent bank withdrawal, but thanks to a warning from her friend, Madam Ruby LaSalle (Elaine Stritch), Lorna decides not to run off with Saunders' money. Inexplicably, Saunders falls quickly in love with Lorna and marries her. 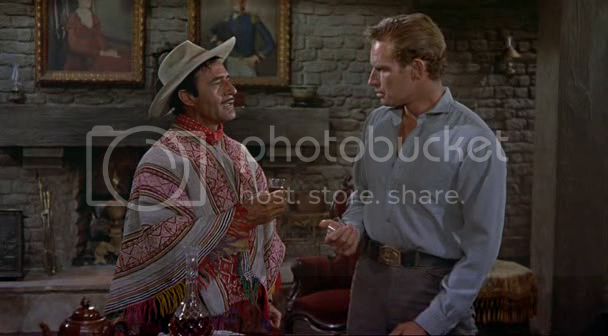 He takes his new bride to the Bar S Ranch, where they meet the Saunders' loyal head vaquero, Innocencio Ortega (Gilbert Roland), and Colt's bitter one-armed brother, Beauregard, better known as Cinch (Tryon). At this point, Three Violent People becomes a bit muddled in what exactly it is about. There are two stories rattling about. The first involves the carpetbaggers, who are taking property left right and center, with their eyes on the Bar S Ranch. The other involves our three violent people: whether Lorna wants to hide her past from Colt and whether Cinch wants to keep the Bar S or sell it (and the hidden herd of horses) from under Colt's nose to get money and run off. Things get complicated when one of the carpetbaggers recognizes Lorna from her 'dance hall days'. The carpetbaggers think they can use Lorna's past against Colt, but Colt keeps a stiff upper lip. He's still angry, and Lorna is shamed, but she's also pregnant. A deal is struck: he'll give her the deed to the horses and she can sell them in exchange for the baby. Cinch convinces Lorna to join him in cutting Colt out of things, but the plot fails. Lorna stays at the Bar S until the baby's born. Colt isn't happy about any of this, down to ordering Innocencio to not toast the birth of his son. Innocencio, hurt and angry at the rejection, quits being head vaquero and says he'll take his sons with him. 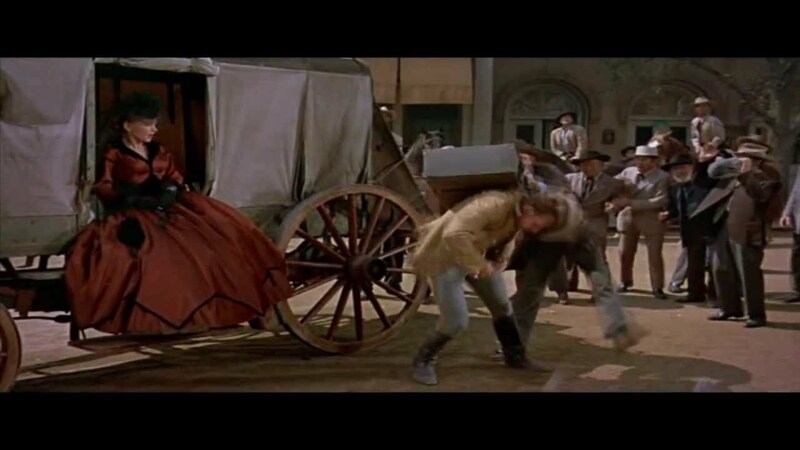 Just when Innocencio, his sons, and Lorna are getting ready to be thrown out, the carpetbaggers come with Cinch having turned against his brother (who said he'd kill him if he set foot back at the ranch again. A major shootout occurs, Cinch sacrifices himself for his brother, and Colt, realizing that Lorna does love him and their new son, forgives her and they reconcile. Three Violent People was made after The Ten Commandments but released before it, as DeMille was deep in editing. As such, it reunited Heston with Baxter and gave audiences a chance to see them as a romantic team. It would have shown that they had little chemistry, at least in Three Violent People. A big part of the problem here is with Baxter: we can't tell through her performance whether she was ever in love with Colt or not. She starts out as an obvious golddigger, with such a blatantly exaggerated Southern manner and drawl that you are genuinely wondering whether she was told to overact. Even when she marries him, we never get a sense that she even likes him. Baxter throughout the film was either over or underacting, looking either obviously fake or disinterested. In the beginning, she didn't seem to care whether Colt ever found out she was a good-time girl, but later on she tried to make it look like she was devastated or ashamed of her past. Part of it is Baxter's performance, and part of it is the script, which never settled as to what to make of Lorna. Perhaps if she hadn't started out as such an obvious hussy, or at least a hussy that wanted to put her past behind her, we could have had the inner conflict the film wanted us to see. The script also has a big issue with the rush that Colt all but orders Lorna to marry him. It looks like it was done in a day, two at most. It makes Colt look like a lunatic or an idiot, or even both. Maybe if she had been a mail-order bride, we could have had some logic to it, but it looked almost comical. Tryon's Cinch was all rage but still ended up as slightly funny. 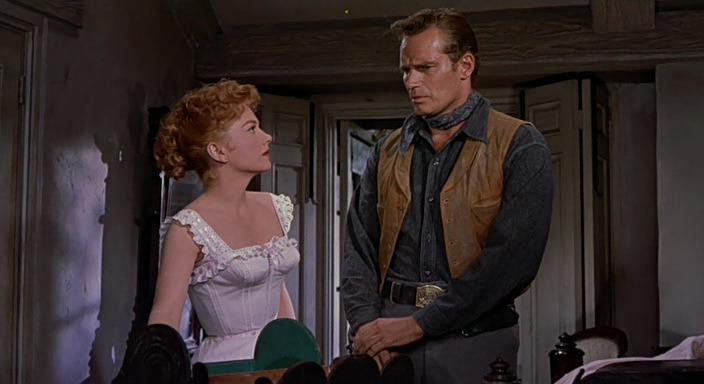 Heston, I think, tried to do what he could to bring life to such a stiff figure as Colt, but he couldn't make him into someone with some sense to him. It's interesting that out of all the performances, it was the non-violent people who stood out best. Roland was elegant and strong as the head vaquero, loyal to the Saunders family but not afraid to tell them what's what. He brought lightness to Innocencio, whether he was berating his sons on their inability to properly introduce themselves to Mrs. Saunders or musing on the true nature of love. When he was amusing, at least it was meant to be funny. One is surprised to see Elaine Stritch in Three Violent People (and looking actually attractive) as the madam with a quick wit, but her few scenes showed she was again, shrewd and amusing. It's a shame that with two interesting characters as Innocencio and Ruby, we are stuck with Colt, Lorna, and Cinch. I'd rather watch a film about Innocencio having to rescue these three gringos or Ruby and her clientele. It is sad more than surprising that out of five sons, only one was actually Hispanic (Leo Castillo). The others weren't, but two names struck out. The first was Bobby Blake, better known as Robert Blake, future star of Baretta who was tried for murder. The other is Jameel Farah, who later Americanized his name to Jamie Farr and became better known as Corporal Klinger on M*A*S*H.
An Italian and a Lebanese playing Mexican characters? Well, not as bad as when Heston would don brownface in Touch of Evil, I guess. Three Violent People is pretty disposable ware, the type you could watch on late-night Western night and not think too much on it. Apart from Roland, Stritch, and the climatic shootout, it's not good, but some elements within it are good enough to warrant perhaps a remake with modifications.